Thirteen students, Ms. Benel, and Rabbi Albo spent part of their Presidents' week vacation answering the call of "Hineni." Day 1: On February 11, 2018, the altruistic group departed from JFK Airport for San Juan, Puerto Rico, for a Chesed-Service Mission to help clean up and meet people affected by last September's Hurricane Maria. When we got off of the plane at San Juan Airport, we met teenagers from the group PR4PR and their director, Levid Ortiz. After an initial meeting, we immediately got to work at a relief warehouse. Side by side with our Puerto Rican peers, we packaged bags, filling them with groceries, including canned goods and fresh food. After that, we traveled to deliver these food packages to a village on the outskirts of San Juan that was deeply affected by the hurricane. When we arrived at the village, we encountered hundreds of people, including many elderly and children, lined up waiting for our delivery. It was heartbreaking and shocking to walk through the devastated areas to see people still without power or water, or living in homes that still don't have roofs. It was painful to walk through towns where trees and debris are still all over the ground months after the hurricane. We then went to the Chabad of Puerto Rico for dinner with our PR4PR peers, where we met Rabbi Zarchi, who shared his personal experience during the hurricane. Rabbi Zarchi told us how when he realized his Chabad House was one of the only spots with power on the island (because of a generator), he opened the Chabad center to anyone who needed food and began distributing food throughout the island. To finish off the night, we all went bowling -- for many of the PR4PR teens, it was their first time in a bowling ally, something that we all have done many times. Even with the language barrier, we had such a fun time bowling with them and sharing our stories with each other. Day 2: We woke up early the next morning to travel to a field and help re-plant plantain trees that were ravaged in the hurricane and clean up debris from a nearby stable. Planting trees was a new experience for many of us, but it was very fulfilling to literally restore life back to Puerto Rico, even if it meant getting dirty. When we finished planting and cleaning, we went to an outdoor basketball court to repaint the bleachers and paint a mural on the wall. 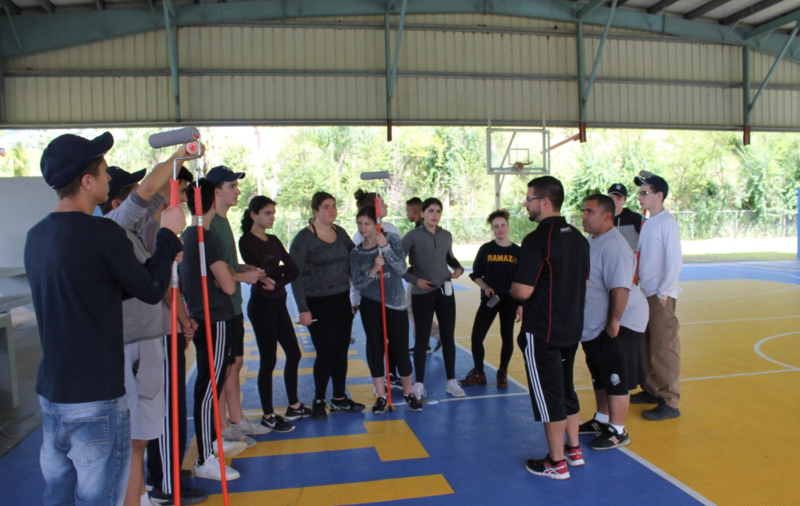 Our group had the opportunity to meet a new group of teens from PR4PR, and played a friendly game of basketball with them at a nearby court. It was fun to play with them, and impactful to realize that even though we have very different lives, we still enjoy many of the same activities. This feeling continued as we all went to Bounce trampoline park, where we let loose after a hard day's work and had a great time together. Day 3: After two busy days, our trip was quickly coming to an end. To start off our final day, we visited the Chabad one last time and expressed our gratitude to Rabbi Zarchi. Next, we traveled to a senior residence where we delivered care packages to the elderly and sang and danced with them while Rabbi Albo played guitar. It was really inspiring to see these people, who were all severely effected by Hurricane Maria in many different ways -- now so lively, hopeful, and full of positive energy. After saying goodbye to the members of the senior residence, we went on a walking tour of Old San Juan, where we got to see national historic sites, including Castillo San Felipe del Morro, the old city walls, the San Juan gate, and more. The view overlooking the water was simply breathtaking! To end our day in San Juan, we met with a few local government officials who spoke to us about how the government is rebuilding after Maria and let us ask any questions we had about the Puerto Rican government. We also had the opportunity to meet with Mr. David Efron, who is the Honorary Consul of Israel in San Juan, and spoke to him about what it's like to represent Israel at this level, in a place without a large Jewish community. All in all, it was really fulfilling and inspiring to spend the first few days of our vacation helping others. We got to learn about the devastation by interacting with many different people and by performing numerous tasks. One of the main things I took away from this mission is that while merely looking at the devastating hurricane pictures is important, taking action is what's most important. Whether it's actually traveling to Puerto Rico, sending supplies, donating money, or even promoting tourists to travel there, any action helps. I came away from this trip feeling very inspired by the people and the community there, who, despite their terrible and tragic stories, continue to live on as happy people who uplift the spirits of those around them, despite everything they have endured.